Christmas is right around the corner 5 DAYS!!!! As my daughter so happily reminded me this morning.. There are sadly 3 wrapped presents under the tree… because I am a last minute person.. and I’ve learned in the past when I would wrap gifts early and have them under the tree, they would develop mysterious holes or gaps on the sides where a little elf tried to peek in the box..So on Christmas morning when that elf would say “I Love This Sweater” before the box was even opened, I knew I needed to re-think putting gifts under the tree so early.. And this year , its definitely difficult because my 18 month old thinks that anything, ANYTHING in his path is fair game for destruction and should be thrown in the trash (or toilet) or eaten..
Christmas doesn’t only mean gifts.. it also means food, lots of food and sweet treats that I tell myself it’s ok to eat because after the New Year I will get back into shape before bikini season only to wait until 2 weeks before its time to go to the beach to realize that I probably shouldn’t of eaten all that Red Velvet Cake. This year I came up with a plan that won’t put me on that same path. 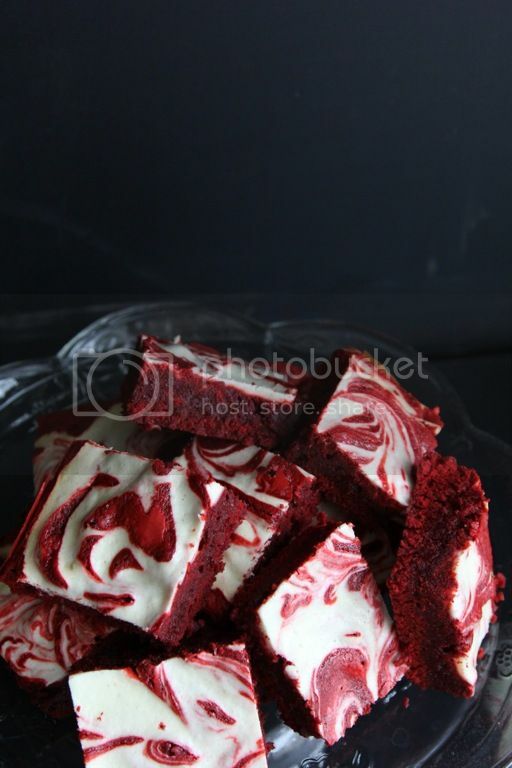 I’ll make Red Velvet Brownies instead of cake, because that is way less fattening.. So it’s ok if I eat half the pan. In a large microwave safe bowl, melt butter and chocolate on high for 2 minutes, stirring in 30 seconds intervals until smooth. Remove from microwave and stir in 2 cups sugar, add 1 egg at a time mixing together until blended after each addition. 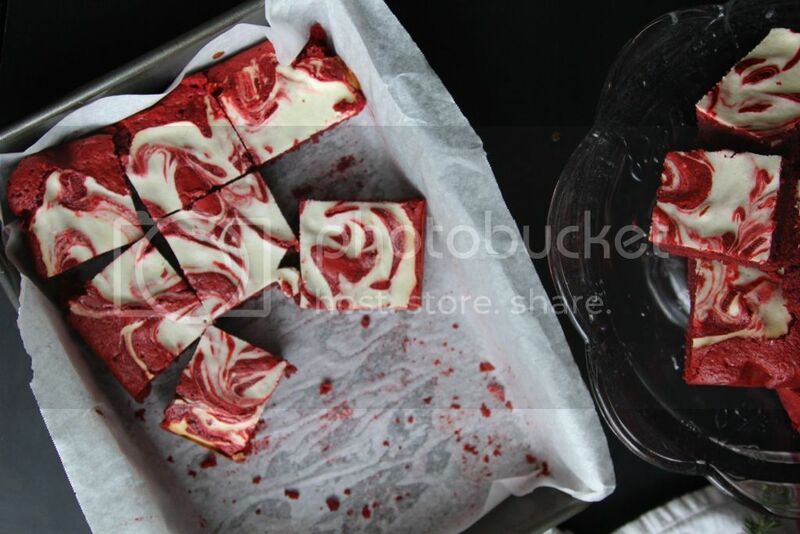 Stir in food coloring and vanilla extract. Gently stir in 1 ½ cup floor and salt until well combined, pour batter into prepared baking pan. In the bowl of a stand mixer, beat cream cheese and remaining ¼ cup of sugar at medium speed until fluffy. Add in egg whites and remaining 1 tsp. of vanilla extract and beat until well blended. Stir in 2 tbsp. of flour until smooth. 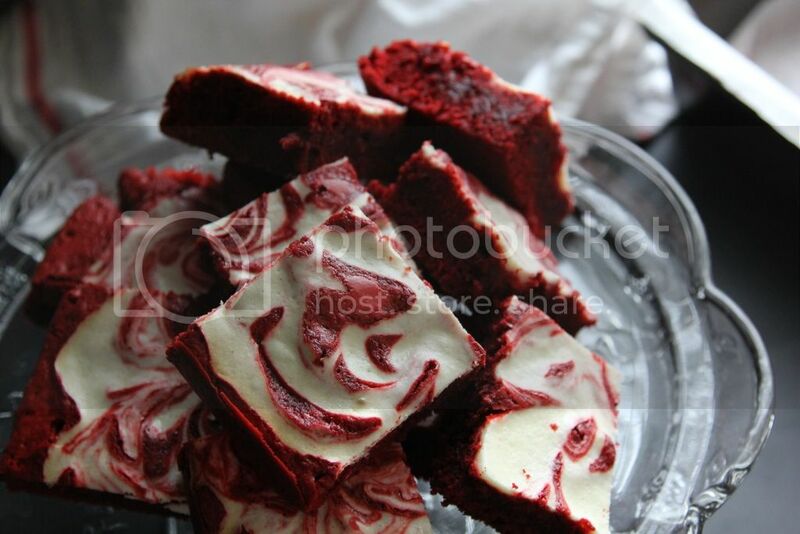 Drop cream cheese mixture in large spoonfuls over the red velvet mixture in pan, then gently swirl with a knife. Bake at 350 for 30-35 minutes or until a inserted wooden toothpick comes out clean from the center. 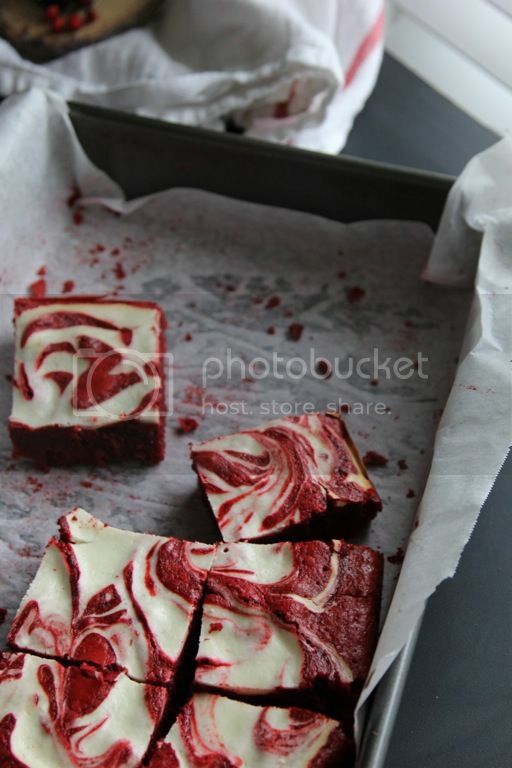 Let cool remove brownies from pan and cut into squares….